Normally at this time of year, Wilbraham Park in West Cape May, New Jersey is a pretty depressing place. It’s still at the tail-end of winter there, so everything’s dark and dreary and generally not the most pleasant to look at. 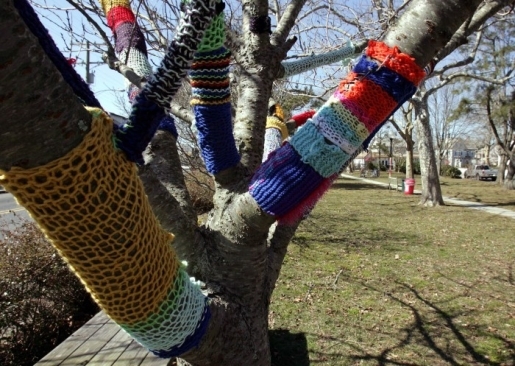 Of course, when spring comes, everything will be green again, but until then someone known as the Midnight Knitter has taken it upon him or herself to knit scarves, leggings, cozies, and yarn coverings for trees and lamp posts in the area. While the town is mostly pro-Midnight Knitter, there are some concerns, like when the city will take down the knitted yarn. Residents hope they’ll find a happy medium and remove the brightly-colored works only when they start to fade, tag, or become tattered, and not before then. The police are asking around, but something tells me that the Midnight Knitter will never be caught of his or her own free will, if only because residents seem enthralled by the efforts. It seems like a rare thing for knitting needles to be used for their intended purpose in such a fun way, rather than in a hurtful stabby way.